This annual Lenten Day of Reflection and Reconciliation is the time to understand and appreciate the good news that is given to us at Easter. This year we look into the beauty of the Paschal mystery as an opportunity to find peace in troubled times. It is a time to celebrate the sacrament of reconciliation and to prepare our house to receive the Lord once again at Easter. 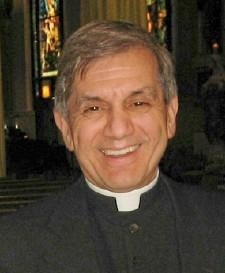 Nationally acclaimed speaker, author, retreat master and teacher; Professor of Liturgy and Preaching, Catholic Theological Union, Chicago, Adjunct faculty, Department of Religious Studies, De Paul University. Central to Fr. Richard’s ministry is a fascination with the power of liturgy and preaching in the transformation of the human heart. He is author of Come to the Feast and co-author with Br. Michael McGrath, O.C.F.S., of both Blessed Art Thou Mother, Lady, Mystic, Queen and At the Name of Jesus: The Way, The Truth and The Light. He has published In Shining Splendor: Fifty Eastertime Meditations, and The Eucharist: 50 Questions from the Pews. Rev. Connor Danstrom was ordained in 2014 as a priest of the Archdiocese of Chicago. He has an S.T.L. degree in systematic theology from the University of Saint Mary of the Lake. He served as associate pastor at St. Benedict parish in Blue Island, IL until 2018, at which time he was appointed the director and chaplain of the St. John Paul II Newman Center at UIC.